Maintenance lead Doug Knott was just about done cleaning up a bunch of items spilled along a highway in Skagit County when he noticed something unusual: A pair of eyes staring at him from underneath a hubcap. 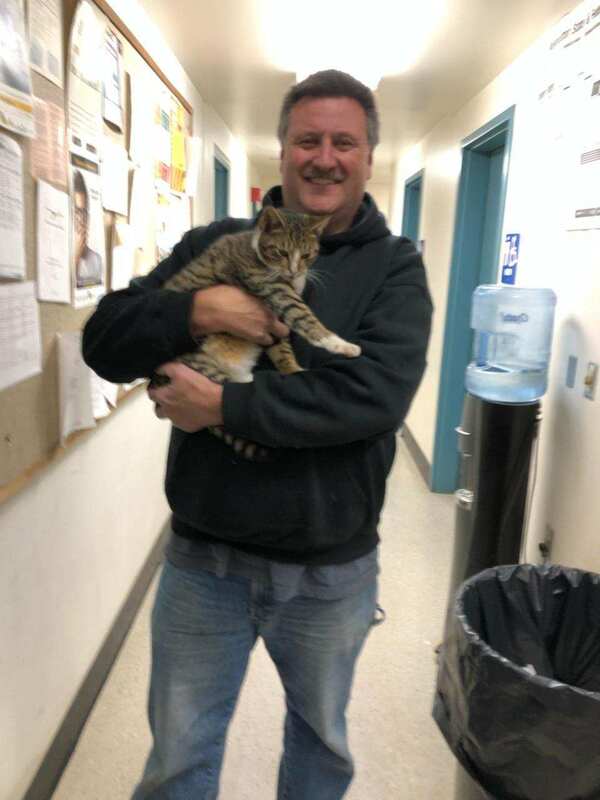 Maintenance lead, Doug Knott, and Lucky after its highway rescue. No, this isn’t the beginning of a Stephen King story. It’s the story of an unusual rescue. Between cleaning up debris from crashes or spilled loads, and helping people who are stranded, our road crews are always busy. On this particular day, the Washington State Patrol called Doug to help clean up a pile of clothes, boxes and other items that appeared to have fallen off a vehicle. While unfortunate – please remember to always secure your loads – it wasn’t particularly unusual. The eyes, though, were certainly unusual. Turns out, the eyes staring back at Doug were from a cat who had been hiding amongst the debris. Doug grabbed his leather work gloves and worked to coax the cat out of its hiding place. For any of us who have cats, you know, this is no easy task. It’s made all the more challenging when you are trying to keep the cat from bolting onto the highway and into passing traffic. But just call Doug the Cat Whisperer. 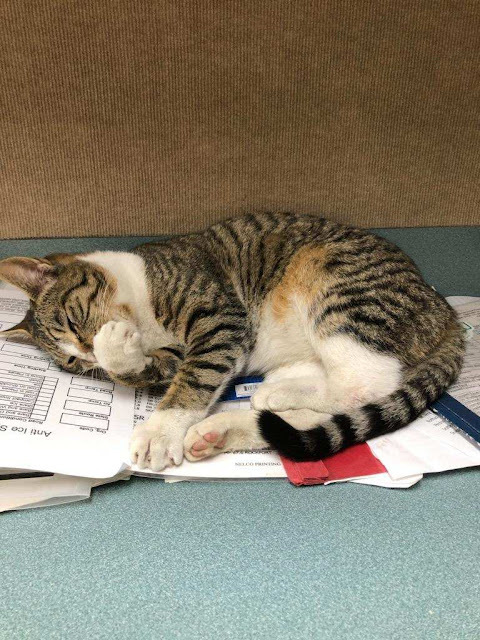 He was able to secure the cat – who his daughter aptly named Lucky. Doug took Lucky to a local vet and outside of a broken tooth and some road rash, found it to be in good shape. 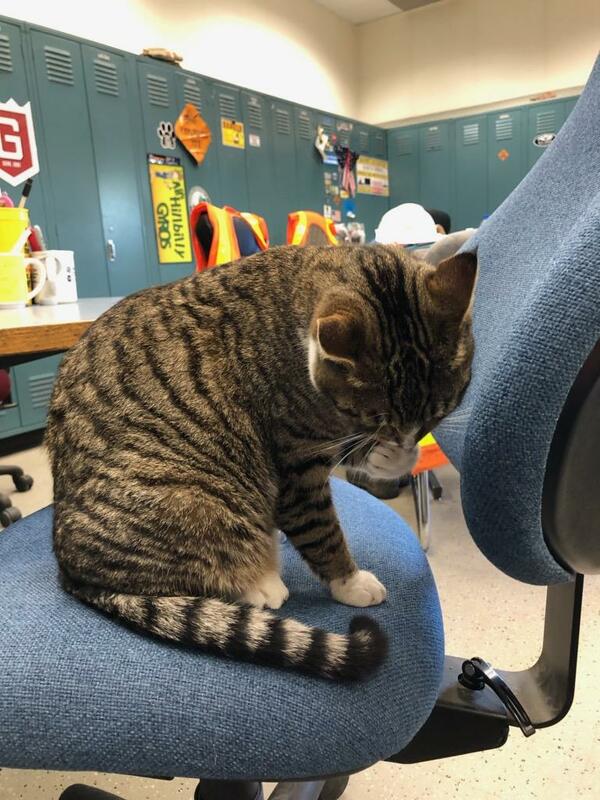 They also learned the cat didn’t have a microchip and the Humane Society of Skagit Valley had no reports of a missing cat. So Doug became a foster dad to Lucky while we wait to see if the cat is claimed. Lucky follows his hero, Doug, around everywhere. 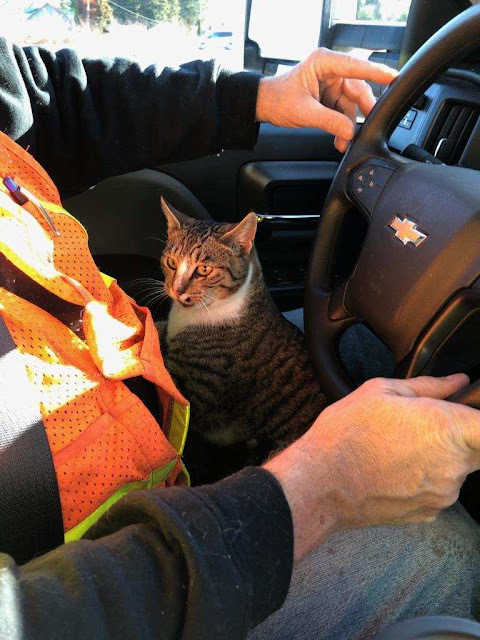 We don’t know how this cat ended up on the highway. Maybe Lucky fell off a vehicle while being moved or hitched a ride by hiding in a vehicle without humans noticing. Or maybe Lucky was just looking for a warm place to hide. What we do know is that everyone – except maybe Doug’s dog – is grateful that our caring crews were there to find and rescue Lucky. If you’ve lost a cat and think Lucky may be yours, please call Skagit Humane at 360-757-0445 and let them know the cat’s gender and which highway in Skagit County it might have been lost on/wandering near. Hip hip hooray for animal lover public workers. Thanks Doug! Doug is a great human - and we need lots of you ! Well done Doug! It is really good to know there are folks out there like yourself with a heart! Cats are such unique animals and deserve to be loved and wanted! Great story. Thanks for sharing. Doug's a great guy. Hope the cat finds a good home. The only comment I have is that I had seen Doug and Luckys story on the news. I still feel good for Lucky and Doug! Ferries’ haiku contest is back!